Seems everyone is talking about Alain de Botton’s new book. Good. It looks like a worthy tome. I’ve yet to read it (my PhD reading list puts leisure philosophy on the backburner for now), but I intend to soon. 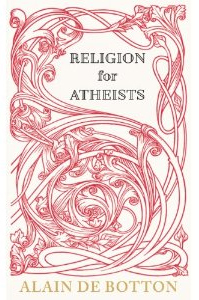 The book, Religion for Atheists, argues that while the supernaturalist claims of religion are false, religion still offers many things that we discard only to our detriment. Happily, it’s a subject about which I have strong and sympathetic feelings. Sadly it’s also the topic of a book I was going to pen post-PhD, but he’s beaten me to it (and likely to have done a far superior job to me anyway). One wonders how this impeccably liberal author would react to being told that free speech and civil rights were all bunkum, but that they had their social uses and so shouldn’t be knocked. What Eagleton has failed to understand is that de Botton is separating the functions of religion from their supernaturalist justifications. And it’s only the latter that he’s calling “bunkum”. Should free speech and civil rights be justified according to some supernaturalist tradition that suggested they were imperatives thrust upon us by the Man in the Moon, de Botton would likely happily reject the justification, but argue on rational grounds that free speech and civil rights are well worth keeping – for the function they serve in social life. It’s their very “social uses” that makes them not “bunkum”. This is the core twist of de Botton’s approach, and one to which I subscribe wholeheartedly. We absolutely must separate the function of institutions from their supposed justifications. We must then examine what justifications they might have rationally, and only keep them if they pass rational muster. Religion’s truck has been to foist many beneficial practices on us, but to justify them with a false metaphysics, assuming it’s the metaphysics rather than the function that is important. Then they overextend and issue more edicts justified by the same bunkum metaphysics, except these ones are harmful to human wellbeing and society. But because religion’s justificatory system is resistant to scrutiny and self-correction (unlike reason and the scientific method, for example), they resist moves to correct their errors. It’s no surprise, then, that atheists seek to tear down the supernaturalist edifice that causes these social ills. But the militant atheist also doesn’t discriminate between the function and the justification, and so seeks to eliminate the entire system – the good functions with the bad justifications. It’s precisely the approach of de Botton that seeks to investigate those things that are genuinely beneficial to humans wellbeing and to society on rational grounds, and instantiate them, that is the right approach. And it turns out many (but not all) things created by religion can do just that. Why not learn from that in the pursuit of wellbeing and social harmony? Eagleton fails to understand this argument, and that’s why his criticism is, sadly, little more than a straw man.